Dennis Rodman wears a PotCoin T-Shirt at Beijing Capital International Airport in June 2017. Cannabis-focused cryptocurrency PotCoin nabbed global headlines in recent days by sponsoring former NBA star Dennis Rodman’s trip to Singapore for the historic meeting of President Donald Trump and North Korean leader Kim Jong Un. Mainstream outlets, including Forbes, Newsweek, The Guardian and The Washington Post, blasted images of Rodman dawning a PotCoin logo T-Shirt across the web and social media – providing a huge marketing boost for the cannabis-focused cryptocurrency company. PotCoin’s price shot up to 10 cents per coin early Tuesday, an increase of nearly 20% from the previous day’s price, according to CoinMarketCap. “Finding ways to communicate directly with consumers in this industry because of the advertising regulations is one of the largest hurdles,” Lily Colley, national marketing director for edibles maker Incredibles, told Marijuana Business Daily. 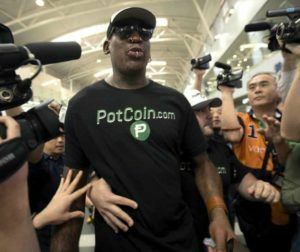 Rodman’s visit to Singapore marked his second highly publicized trip sponsored by PotCoin. Last June, PotCoin sponsored a Rodman visit to North Korea after his previous sponsor, Paddy Power, dropped out.